Today was a 30% chance of showers, so of course as soon as I get to the back of the park, it started raining. I met up with Davy, but we only got a few miles in before the rain started. We had parked at different entrances, so we split up to head back to our cars. I had about 3 miles to go to get back to the car and you can see that I got covered in sandy mud. 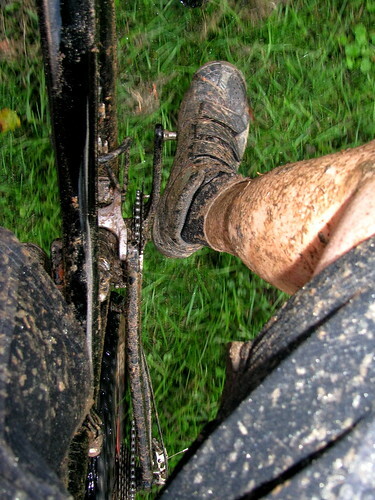 Now I’m gonna have to clean the bike up and get all that sand out of the nooks and crannies. I hope that the rain stays away tomorrow since they are calling for temps in the upper 60s. This time of year is absolutely perfect for bike riding. Give me a call if you want to ride anytime soon. I think Davy and I are going to try to reenact our efforts tomorrow after work if you want to join. Today marked the start of the fall bio-monitoring (biomon) season for me. 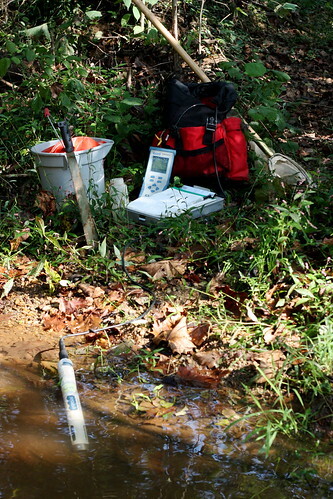 Biomon requires hiking down to a stream and collecting a sample of the bugs that make their home in the creek. These bugs are referred to as benthic macro-invertebrates and are an important indicator of stream health. To collect the sample we use a net mounted on a D shaped frame. The flat end of the net is placed along the stream bottom, downstream of the habitat to be sampled. Then we kick the area in front of the net to free them from their hiding places. After we’ve collected the sample, we take it back to the lab and then identify the bugs we’ve found. By determining which bugs live in the stream and in what abundce, we can get an idea of how healthy the stream is. For example, certian bugs are fragile and won’t survive in poor conditions, so when we find them we know it’s a reasonably healthy stream. This is my favorite part of my job and was the draw that kept me working as an intern for so long. I’m really excited about what this season will bring and I hope to take a lot of new pictures. Today I woke up with a scratchy throat and I was really worried I was getting sick. I spent most of the morning gathering all the home remedies I knew of to combat the sore throat. I gargled salt water and cayenne pepper, sucked on lozenges, and made a steam tent. It really helped and I felt a lot better very quickly. I was still feeling run down from all the late nights at the beach and planned to stay on the couch most of the day. I decided today would be a good day to make a pot of chili and watch some football. Cincinnati chili is more of a meat sauce than a chili, but it is by far my favorite type of chili. You stir 2 pounds of lean ground beef into a quart of water and then slowly boil it. Then add two cans of tomato sauce and a wide array of spices including whole cloves, bay leaves, cinnamon, and chocolate. It is traditionally served over hot dogs (coneys), spaghetti, and baked potatoes. 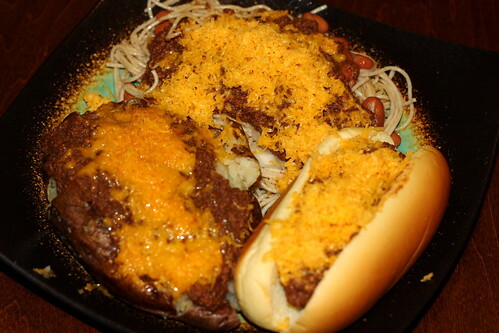 When served over spaghetti you can add cheese (3-way), cheese and onions (4-way), or cheese, onions, and pintos (5-way). I invited some friends over and we tore into it. Everyone really liked it, despite it being quite different than the traditional chili they were used to. I really love my homemade chili, but I still have to stop and get a few coneys at Skyline Chili when I’m in Ohio. Only another two weeks until I’ll have that opportunity again. All in all I’ve been very happy with my move to Lynchburg almost two years ago. There are always things that I miss, most obviously family and friends, but restaurants too. When I first started working at a bike shop, we were located next to the Chesapeake Bagel Bakery. This place was absolutely amazing and is still my measuring stick for a bagel shop. They had every kind of bagel you’d want, all kinds of pastries and cakes, and high quality deli meats for sandwiches. My favorite was the cinnamon raisin bagel knot (the leftover dough piled up and cooked) with homemade cream cheese frosting. Unfortunately, they closed their doors in Richmond to focus on their shops in Chesapeake. For a while here in Lynchburg, we had a halfway decent bagel shop called Don’s Bagels. Nothing special, but it was the only place in town to get bacon, egg, and cheese on a fresh bagel. The pastries always tasted like some weird preservative and the selection was terrible, but they had no competition. As you can tell by my use of the past tense, they too have shut their doors, once again leaving me without my favorite choice for breakfast. Now the only place I can go to get my fix is very far from home. 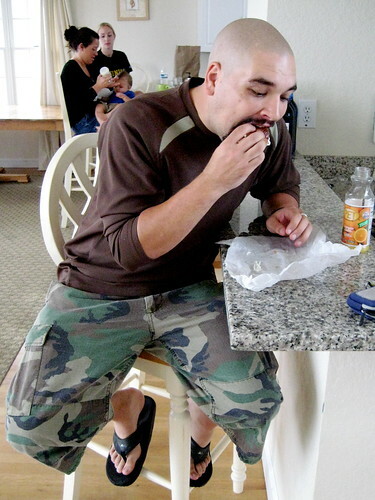 Lighthouse Bagels in the Outer Banks is the only place I eat breakfast while I’m down there. It had been a couple years since I’d been there, but I’m happy to report that unlike those other restaurants, they are still open for business. They don’t quite have the variety to challenge Chesapeake Bagel Bakery, but they do have a french toast bagel that is amazing. It truly is one of the things that makes me the most sad about leaving the beach. I wish Lynchburg could get it’s act together and open up a bagel shop that would rival one of my favorites, but for now, I’d settle for just about anything. Today is my last day at the beach and I’ll be heading back to Lynchburg tomorrow morning. I’m sad to have to leave, but I’m excited to see my friends again. It’s been two weeks since I’ve been able to hang out with Davy & Kelly and that means it’s been two weeks without Mexican dinner. We pretty much have a standing Thursday dinner date at whatever Mexican restaurant we are closest to, but without them here I’ve missed out. I miss hanging out with them and goofing off at my apartment. 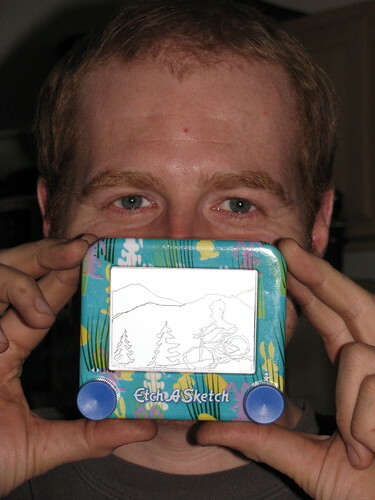 As you can see, Davy was excited to find this Etch-A-Sketch on my countertop. He was an art major at William & Mary and while I was making dinner, he whipped this up in about 10 minutes. I don’t think I’ve ever actually drawn anything on an Etch-A-Sketch, I just like to mess it up and then shake it clean. My hat is off to you sir. I hope you had a great time out west, but most importantly, I hope you worked up an appetite for a California burrito. 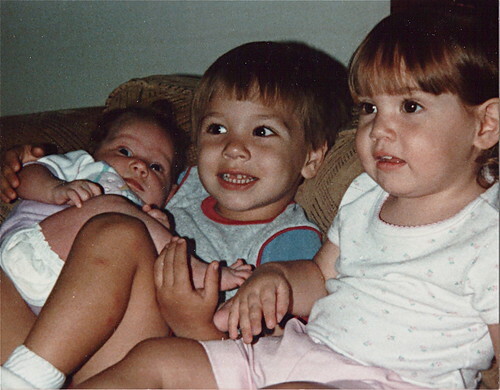 Today my little sister (the one on the right) is getting married and it seems like it wasn’t that long ago that we were still just little kids. I know it’s cliche, but you really do grow up fast. I’m so happy for her that she’s found a great guy and is ready to set out on the next big adventure in life. It’s very obvious in my interactions with them that they care deeply for each other and are committed to making things work. That being said, it doesn’t really ever seem like they are working too hard. It seems to be a natural connection where they are in tune to each other. She’s had other boyfriends before, but I’ve never seen her as happy as she is now. She’s a beautiful girl and has always had boys chasing her, but I’m so proud of her for being picky enough to find that perfect one. I know they’ll be great for each other forever and I’m excited to be a part of their wedding. Heading down to the beach made me go looking through some old pictures of my previous trips. 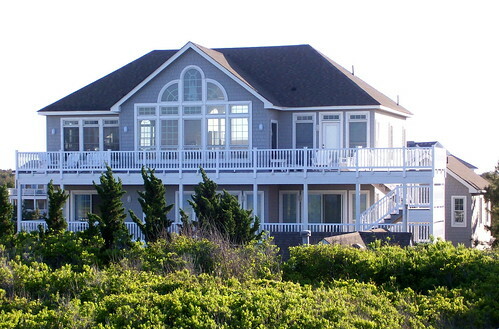 When I lived in Richmond, my next door neighbors owned a house in Corolla and would rent it to me and my friends in the offseason for cheap. All through college we’d make it down there twice a year in the spring and fall and cut loose for a few days. This is a picture from a trip further down the Outer Banks to Jockey’s Ridge near where the Wright brothers took their first flight. Nick and I did our best to try to fly, but we just free fell for a few feet. 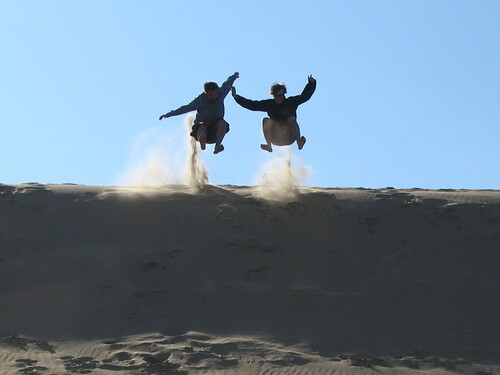 The tops of these sand dunes is also a great place to see how far you can throw a disc. It’s really an awesome vantage point because you’re 100 feet high on a strip of land that’s only a couple thousand feet wide. Looking at these pictures really makes me miss that time of my life, but hopefully I’ll be able to take some trips with Nick again like we used to. Today marks the start of a few days of vacation that I’m taking to be at my sister’s wedding in Corolla, NC. I’ve been vacationing on the Outer Banks for many years now and I love going down there this time of year. It is relaxing to be at the beach when all the big tourist crowds have died down. This will be the first time staying in a house this big with so many people around, but it should be a lot of fun. My second favorite bagel shop of all time is just a few minutes down the street and I’ll probably eat there every morning. There are a ton of great restaurants and I’m sure that I’ll come back 10 pounds heavier. I’m not going to drive the Jeep down there with these stupid gas prices, but I think some of the other guests have 4x4s, so we’ll be able to drive out on the beach. I’m really looking forward to seeing some extended family and having a few days to relax and get sand between my toes. It’s been almost three weeks since I got my jaw unwired and for the most part everything is back to business as usual. The one thing still standing in my way of a full recovery is the range of motion of my jaw. I went to see a physical therapist today and she suggested a few exercises I could do to help regain my ability to open wide. She wanted me to practice carefully opening and closing my mouth with perfect symmetry and not favoring one side or the other. Then she asked me to open my mouth slightly and hold my jaw in place while I applied pressure from each side alternately. The last exercise she gave me was the one your looking at in the picture. 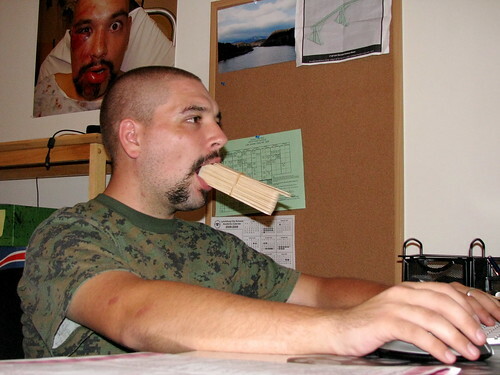 I’m supposed to take a bunch of popsicle sticks and prop my mouth open for sixty seconds at a time. You wouldn’t believe how much you drool in this position. I’m already starting to see the benefits though. She said the average range of motion for the jaw is 40-50mm and when I came in I was at 32mm. Today was my second visit and I’m already at 38mm, so I hope I’ll get close to 50mm in the next few weeks. My Friends Davy and Kelly are out in Oregon and or Washington state riding their bikes and enjoying themselves. Meanwhile I’m stuck here in Lynchburg dealing with this monster. She’s stinking up my apartment and laying on my couch while I’m gone. 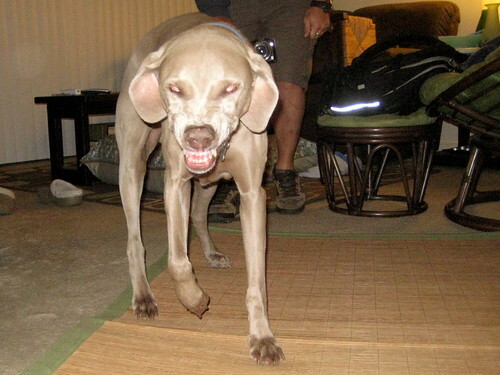 Then I come home and she chases me around while she makes this awful face. Actually, she just sleeps all day, but she does kinda smell. And the face she’s making is something we call cheesing and it’s horribly cute despite what this picture shows. When we come home she gets so excited that she actually starts smiling. If you look closely at this cheesing video you can see it’s a big toothy grin like The Joker in the Dark Knight. We’ve really enjoyed having her here, but lately I can tell she’s getting homesick. Hang in there Iris, not much longer now and Kelly will be back to squeeze you.